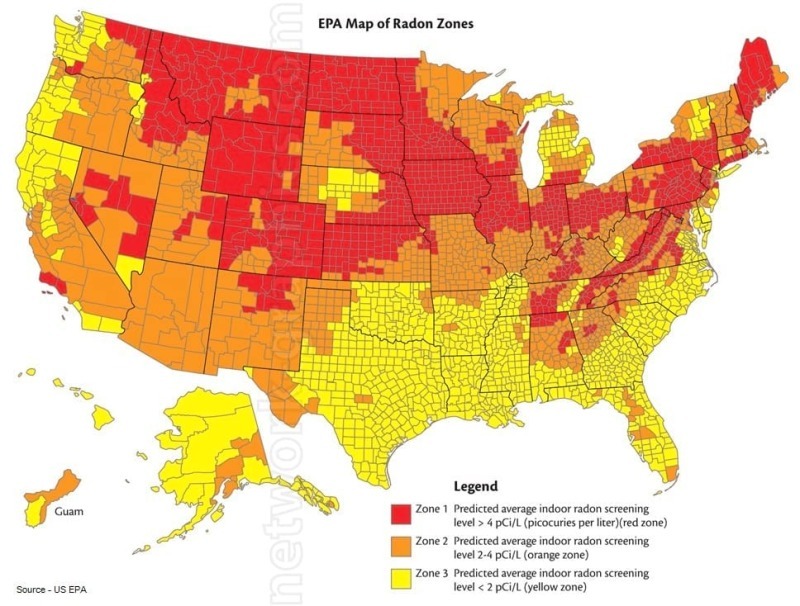 What is Radon and where is it found? Radon is a naturally occurring radioactive gas and comes from the natural breakdown (radioactive decay) of uranium. It's usually found in igneous rock and soil. It enters homes due to thermal stack affect; the home is "sucking" radon gas up through cracks in the foundation and other openings. Air pressure inside your home is lower than the air pressure in the soil around your home's foundation. The radon then gets trapped inside and builds up to levels above the EPA's recommended action level which is 4.0 pCi/L. The national average indoor level of radon is 1.25 pCi/L, while the average outdoor radon level is 0.4 pCi/L. Although 4.0 pCi/L is the action level set by the EPA, levels below 4.0 pCi/L also pose health risks. 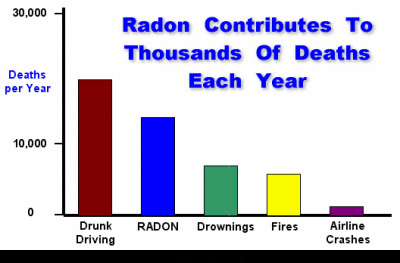 By having your home tested you can see how much radon you and your family are being exposed to. Radon levels can vary greatly from house to house. Your neighbor may have 1.2 pCi/L, but your house may have 12.5 pCi/L. The only way to know what levels of radon your house has is to have it tested. 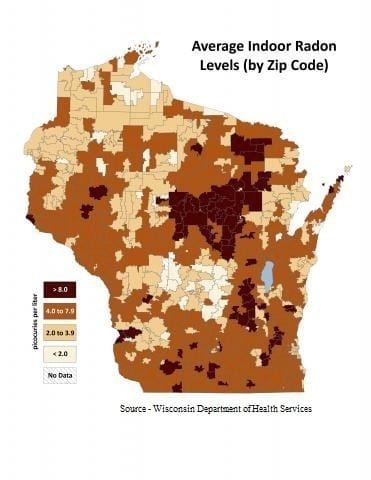 Click on the map above to go to Wisconsin Department of Health Services interactive map. On there you will find that in Eau Claire County, 24% - 41% of homes tested had radon levels greater than or equal to 4.0 pCi/L. The EPA has set 4.0 pCi/L as the action level to have your home mitigated.